The game-changing power of solar energy is a gift to all of the global community. Nations of the world, having recognized the absolute necessity to do so, are slowly shifting towards a clean energy economy while reaping the benefits. These benefits are being particularly felt in the developing economies of the Global South, where communities are making the transition from no electricity access to resilient, local power through solar energy. 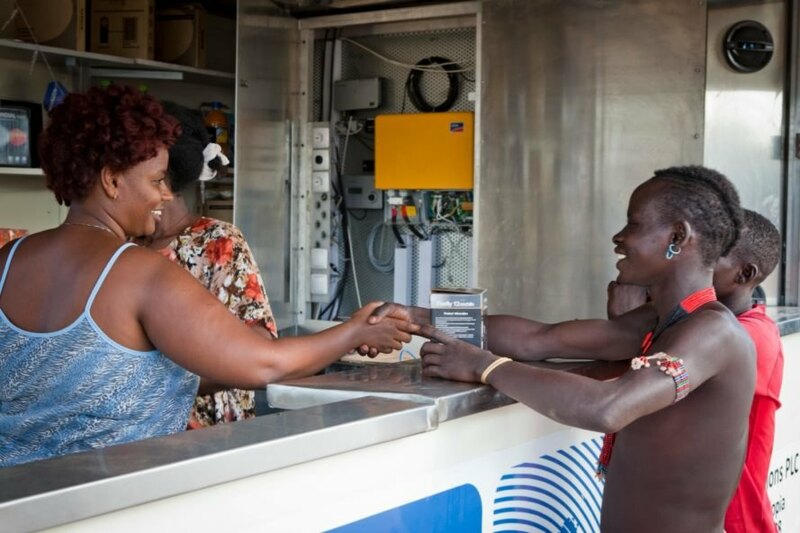 SOLARKIOSK, a Berlin-based social enterprise, is supporting this movement and empowering local communities by installing innovative multi-purpose structures called E-HUBBs that are powered by the sun and operated by members of the communities they serve. 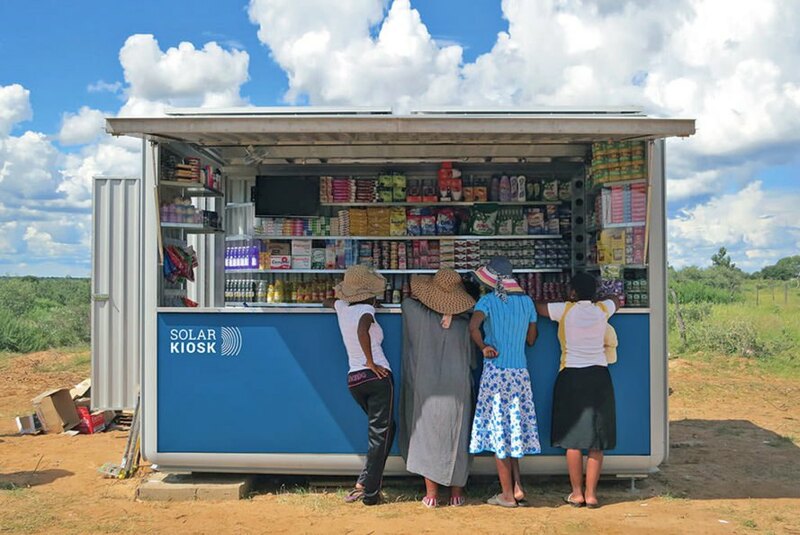 SOLARKIOSK has been selected as a semifinalist for the 2017 Buckminster Fuller Challenge – read on for a closer look at this world-changing initiative. Although similar in appearance to shipping container homes, the E-HUBB is emphatically much more – it’s “an energy-connectivity gateway.” With the energy generated through its solar panels, a single E-HUBB can provide power for phone and computer charging, a Wi-Fi hotspot, an LED TV, a refrigerator, a printer, interior and exterior lighting, and more. It also offers a display area and storage space, solar products and sustainable consumer goods. E-HUBBs have proven their versatility by serving the needs of different communities. A last-mile distribution retail E-HUBB brings underserved populations much needed products and services across Sub-Saharan Africa. There’s also a Connected Solar Clinic operated by the Jordanian Ministry of Health, a banking kiosk that offers financial tools to off-grid populations in Nigeria, and a solar school unit for the displaced population at the Zaatari refugee camp in Jordan. Each E-HUBB is uniquely fitted for the local community’s needs and is operated by members of the community, ninety percent of whom are women. “SOLARKIOSK sees great value in empowering women through job creation within the network of E-HUBBs,” said Makejeva. If it were to receive this award, SOLARKIOSK would be well-positioned to scale up its operations in the coming years. 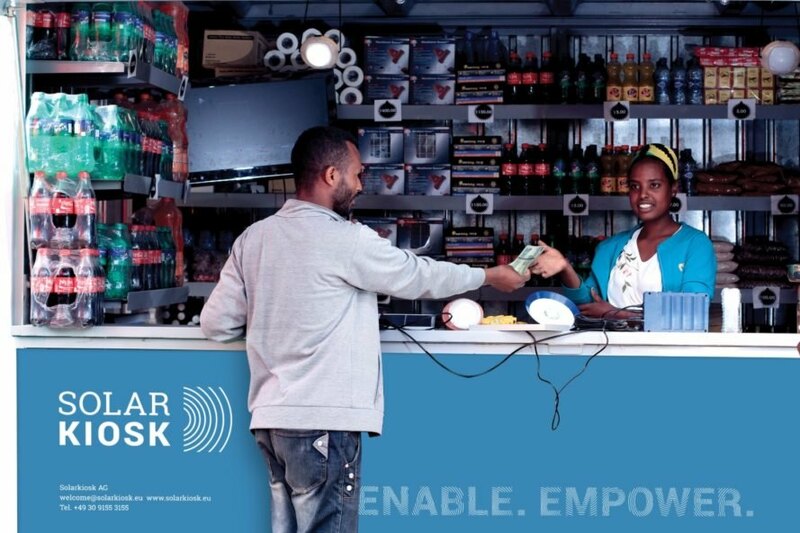 While the economic empowerment gained in a local community through the support of SOLARKIOSK is exceptional, the mission and impact is more than that. An E-HUBB is a center for the community, a gathering place around which people can share stories, build strong relationships, and find inspiration for a brighter future. The game-changing power of solar energy is a gift to all of the global community. Nations of the world, having recognized the absolute necessity to do so, are slowly shifting towards a clean energy economy while reaping the benefits. These benefits are being particularly felt in the developing economies of the Global South, where communities are making the transition from no electricity access to resilient, local power through solar energy. 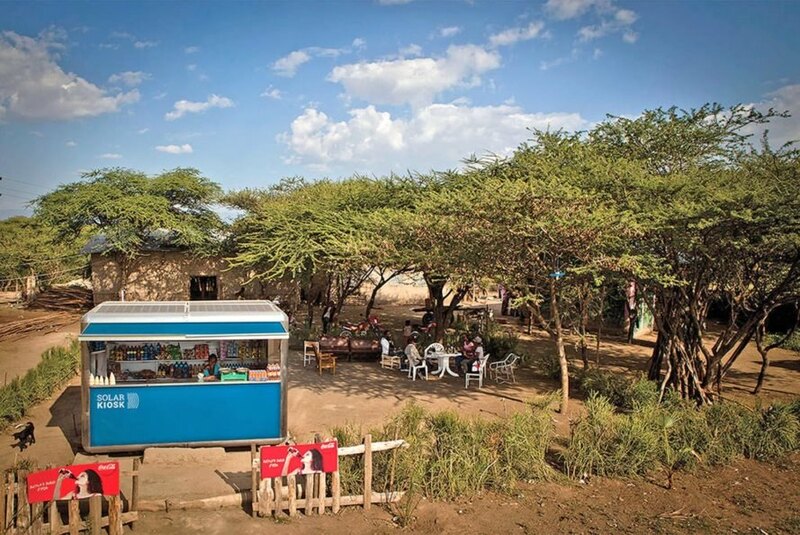 SOLARKIOSK, a Berlin-based social enterprise, is supporting this movement and empowering local communities through innovative multi-purpose structures called E-HUBBs that are powered by the sun and operated by members of the communities they serve. 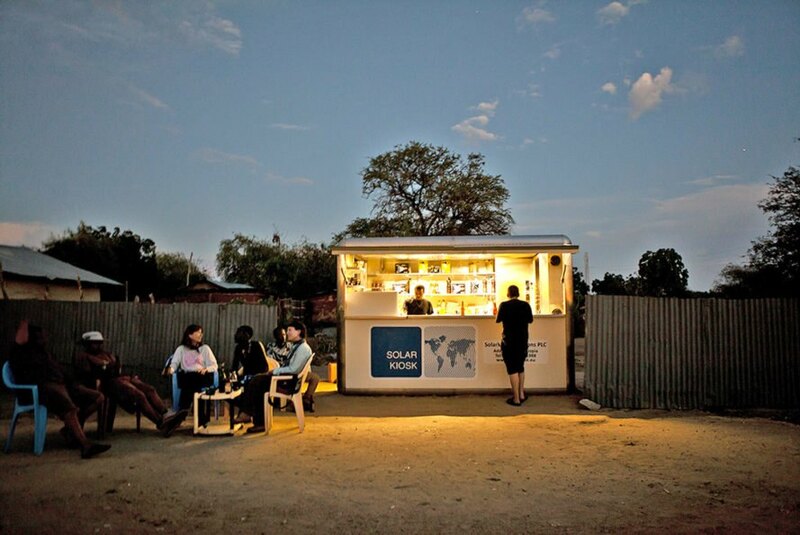 SOLARKIOSK has been selected as a semifinalist for the 2017 Buckminster Fuller Challenge - read on for a closer look at this world-changing initiative. Although similar in appearance to shipping container homes, the E-HUBB is emphatically much more - it's "an energy-connectivity gateway." With the energy generated through its solar panels, a single E-HUBB can provide power for phone and computer charging, a Wi-Fi hotspot, an LED TV, a refrigerator, a printer, interior and exterior lighting, and more. It also offers a display area and storage space, solar products and sustainable consumer goods. "SOLARKIOSK is continuously working on the design of the E-HUBB, in order to make it more efficient in terms of maintenance, implementation and transportation," said Marija Makejeva, Business Development Manager at SOLARKIOSK. "Over time, the design has evolved across 3 different E-HUBB models from an aluminum to a steel structure, which is more cost-efficient and easier to source. Solar components and remote metering options have also undergone significant improvement as technology has evolved." E-HUBBs have proven their versatility by serving the needs of different communities. A last-mile distribution retail E-HUBB brings underserved populations much needed products and services across Sub-Saharan Africa. There's also a Connected Solar Clinic operated by the Jordanian Ministry of Health, a banking kiosk that offers financial tools to off-grid populations in Nigeria, and a solar school unit for the displaced population at the Zaatari refugee camp in Jordan. A man walks by the friendly neighborhood E-Hubb in the evening. A team of men gathered to install an E-HUBB. Local children gather near the E-HUBB to learn about it. An E-HUBB worker chats with a visitor. A visitor speaks with an E-HUBB worker. Phones charging at an E-HUBB. Men prepare the site of an E-HUBB. The game-changing power of solar energy is a gift to all of the global community. Nations of the world, having recognized the absolute necessity to do so, are slowly shifting towards a clean energy economy while reaping the benefits. These benefits are being particularly felt in the developing economies of the Global South, where communities are making the transition from no electricity access to resilient, local power through solar energy. 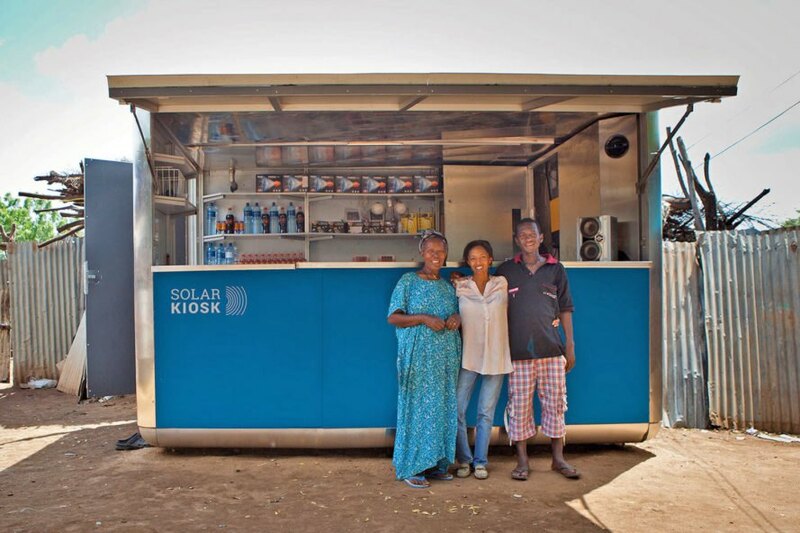 SOLARKIOSK, a Berlin-based social enterprise, is supporting this movement and empowering local communities by installing innovative multi-purpose structures called E-HUBBs that are powered by the sun and operated by members of the communities they serve. SOLARKIOSK has been selected as a semifinalist for the 2017 Buckminster Fuller Challenge - read on for a closer look at this world-changing initiative.